Tallahassee,FL—Was it the power or the money? Or was it both? According to reports, Mr. James Crosby was accepting kickbacks. (Kickbacks for what? How many steaks does one need to eat in a lifetime?) Why are people so GREEDY when it comes to money? In the final debate between Governor Rick Scott and former Governor Charlie Crist, Governor Scott repeatedly talked about growing up without much of anything—particularly money. Governor Scott talked about living in government housing, and how his parents had one car or no car at all. Obviously, Governor Scott’s childhood issues have transformed him into this “American Greedy Man” when it comes to money. History tells us that people who lived through the Great Depression era held onto just about every meaningless item in fear of being without—if a depression was to occur again. History in its correctness–now, just imagine how the people protected items of value. Surely, it must’ve taken years, if not decades for people from the Great Depression era to overcome their fear of being without. During the debates, Governor Scott talked about having met with the parents of Trayvon Martin as if he’d done his duty as a governor to the Black community. (Umm, News Flash—“Not only was George Zimmerman found not guilty, but nothing has been done about the ‘Stand Your Ground Law’. Jordan Davis. Hmm, wonder why Michael Dunn felt so comfortable opening fire on an SUV full of Black teenage boys?” So, yeah, Black Floridians feel much more comfortable knowing that their son can be stalked and then shot dead by their stalker. Or should Black Floridians tell their sons not to play loud music in their vehicles. What’s the definition of loud in Florida? Is it the power or the money? Or is it both? Why are people so GREEDY? Women in the workplace are still fighting for respect and most importantly—equal pay for equal work. And most importantly EQUAL PAY for EQUAL WORK! Was Second Circuit Judge Jackie Fulford compensated for allowing Assistant State Attorney/Prosecutor Jack Campbell and Regional Counsel Daren Shippy to present Mr. Don Odham to the jury as a Leon County Sheriff’s Detective in October 2013? Surely, as a circuit judge, a promotion wasn’t up for grabs. Whatever it was that she was compensated—was it worth it? Judge Fulford and First Regional Conflict Counsel Jeffery Lewis knowingly allowed DeShon Rashard Thomas, a 17-year-old Black male college student, to be convicted of crimes that he did not commit, while leaving the real murderer or murderers in the community. And then before Judge Fulford sentenced DeShon to Two Life Sentences plus 30 years, she spoke about how much DeShon and his dad look-alike. Really! Since DeShon’s dad didn’t come to the trial—Judge Fulford really felt like it was appropriate to speak on DeShon and his dad’s resemblance? Despite the purpose of their being in the courtroom was to impose sentencing. Judge Fulford overlooking that also in the courtroom was the mother and the family of the two victims. The mother, whose two children (her son and a pregnant daughter) was murdered in cold-blood. And Judge Fulford, was amazed at how much the defendant, DeShon, resembles his dad—to the point that she needed to speak on it—right then and there. I’m sure many will agree that Judge Fulford’s comments about DeShon and his dad resembling each other was about as idiotic as Attorney General Pam Bondi and Governor Rick Scott rescheduling an execution in order to accommodate Pam Bondi’s Fundraising campaign (MONEY over integrity). Well, Guess what? Trusting Florida’s Judicial System is what went wrong in DeShon’s life. That’s why he had five different attorneys and two circuit judges over a period of nearly three years—in which all four court appointed attorneys filed Motions to Withdraw—including Regional Counsel Daren Shippy (DeShon’s attorney at trial). Regional Counsel Daren Shippy’s claim to not want to represent DeShon was in part because the previous four attorneys had not done any work on the case to build a defense—no depositions—nothing. DeShon’s previous private paid attorney, Gregory Cummings, Circuit Judge James Hankinson and Assistant State Attorney/Prosecutor Jack Campbell embezzled nearly $30,000 from DeShon’s mother before it dawned on her that all three of them were in bed together and fired Mr. Cummings. Trusting Florida’s Judicial System is what went wrong in DeShon’s life. That’s why State Attorney Willie Meggs along with Leon County Sheriff Larry Campbell and Sheriff Campbell’s son, Assistant State Attorney/Prosecutor Jack Campbell filed legal documents containing false information with the Leon County Clerk of Courts in order to have DeShon charged with the murders. Clearly, those false documents were presented to the grand jury by Assistant Chief State Attorney Georgia Cappleman in order to receive an Indictment to have DeShon charged with the murders—and so on and so forth. Now, it’s just a matter of time before people will be asking what went wrong in Judge Jackie Fulford’s and others lives to join together—to conspire to have a teenager wrongly convicted? DeShon Rashard Thomas is INNOCENT! DeShon Rashard Thomas was a child in an adult judicial system—without being able to identify people who are TRULY EVIL. What’s the difference between the tactics used by Judge Fulford in DeShon’s case and that of former Mascott police officer James Duckett? In 1987, Eleven year-old Teresa McAbee must’ve trusted Police Officer James Duckett. Clearly, if little Teresa was aware that a trusted officer was going to murder her—she would not have climbed into Officer Duckett’s patrol car. A police officer with a badge. A judge with a gavel! Both violated the trust of a child. In the last debate between Governor Rick Scott and former Governor Charlie Crist, Governor Scott attempted to show that Governor Crist was corrupt because some of the folks whom former Governor Crist appointed when he was in office are now in federal prison. Governor Crist responded by stating something to the affect that he wasn’t responsible for the criminal acts of those whom he appointed. It was under Governor Jeb Bush as to when Mr. James Crosby was forced to resign for his criminal acts. Mr. James Crosby—a thirty-one year career ended disgracefully. Unfortunately, others have and will have their careers ended disgracefully. There are no Statute of Limitations on Federal Crimes. Tallahassee, FL—Despite having received laboratory reports from the Florida Department of Law Enforcement and the Federal Bureau of Investigation that DID NOT connect 17-year-old DeShon Thomas to the double homicide of his pregnant ex-girlfriend and her 17-year-old brother, Florida 2nd Judicial State Attorney Willie Meggs and Chief Assistant State Attorney Georgia Cappleman moved forward with presenting the case to the grand jury. But not before Assistant State Attorney Jack Campbell filed documents received by the Leon County Sheriff’s Office that had been padded with false information. Leon County Sheriff Larry Campbell is the father of Assistant State Attorney Jack Campbell who is employed by State Attorney Willie Meggs. 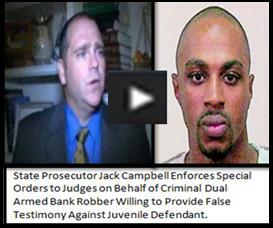 The two Campbell’s have a history of working together in the investigation and prosecution of criminal cases in Tallahassee—this father/son team supported by judges willing to deny defendants their rights and deputies willing to commit perjury—have guaranteed convictions and positive resume builder for both Campbell’s. If past criminal cases were handled like the case of 17-year-old DeShon Thomas’ case, then more than likely the same motive of operation was used—documents containing fraudulent information were presented to get convictions—not evidence. In DeShon Thomas’ case, State Attorney Willie Meggs and Chief Assistant State Attorney Georgia Cappleman were well aware of the fraudulent information prior to going in front of the grand jury. PARENTS BE AWARE: CLEARLY, ELECTED OFFICIALS IN FLORIDA’S CAPITOL CITY ARE PREDATORS—STATE ATTORNEY WILLIE MEGGS AND LEON COUNTY SHERIFF LARRY CAMPBELL ARE DESPERATE, IMMORAL AND SICKENING! THEY PREY ON OUR INNOCENT CHILDREN!